I've been working on a Sandboxing solution that doesn't require Security Scoped Bookmarks, as we've run into several issues using them in real world applications. I've been through several different workarounds and the latest seems to be the easiest. Basically it involves supporting Lion's Persistence/Resume functionality in your application, I've created a feedback report requesting that RS add support for this functionality as it will make it much easier for anyone who is developing an application for the Mac App Store. The key thing is to use the encode/decode methods and to store a NSURL object in the encoder, this causes the access to be preserved through application re-starts. It can currently be done via the MBS plugin or via declares, but it messes with the existing RS application delegate and not only causes events to be lost, but can also lead to crashes. If you're developing apps for the Mac App Store, please add support for this function. You'd think RS/XOJO inc. would make it easier for people to create apps for the App Store...hope they support this! Which is why I'm bringing it everyone's attention, so that RS/Xojo know how important it is to us MAS developers. 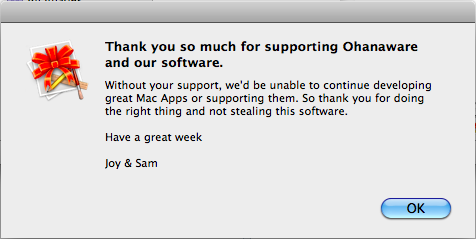 As Xojo isn't yet on the Mac App Store, they've not yet had to go through what we've gone through. Thanks, Christian has been helping me by adding functions to his plugin to help.